After a delay of over a month, Microsoft finally re-released its latest Windows 10 October 2018 Update (version 1809) on November 14. When one thought that Windows 10 October 2018’s share of problems were far from over, it doesn’t seem so. Microsoft has updated its Windows 10 Update history page for version 1809 that provides details of issues affecting Windows 10 client as well as Server. “Mapped drives may fail to reconnect after starting and logging onto a Windows device,” Microsoft says, noting that symptoms include a red X on the mapped network drives in File Explorer. Mapped drives may fail to reconnect after starting and logging onto a Windows device. In File Explorer, a red “X” appears on the mapped network drives. Mapped network drives show as “Unavailable“ when you run the net use command from a command prompt. Workaround: See KB4471218 for workaround scripts to automatically reconnect a mapped network drive when you log on to the device. Next Steps: Microsoft is working on a resolution and will provide updates in the 2019 timeframe. Microsoft and Trend Micro have identified a compatibility issue with Trend Micro’s OfficeScan and Worry-Free Business Security software when attempting to update to Windows 10, version 1809. Next Steps: For information on when critical patches will be available for these products, please refer to Trend Micro’s Business Support Portal. Note: AMD no longer supports Radeon HD2000 and HD4000 series graphic processor units (GPUs). Workaround: To ensure a seamless update experience, we are blocking devices with AMD Radeon HD2000 and HD4000 series graphics processors from being offered Window 10, version 1809. Next Steps: Microsoft is investigating this issue. As you can see from above, Microsoft is having a compatibility issue between the 1809 update and Trend Micro’s OfficeScan and Worry-Free Business Security software. “If a customer tries to retrieve and apply the Windows 10 October 2018 Update via Windows Update before applying the required Trend Micro Critical Patch (CP) – validated by certain driver versions – it will not be able to obtain the update for a period of 60 days from the official release of the Windows 10 October 2018 Update. Please note there will be no warning message,” Trend said. A support page about the issue together with its patches has been posted by Trend Micro. Patches are only available for OfficeScan. Additionally, on the request of Trend Micro, Microsoft has blocked the 1809 update for devices running these security products until a patch from Trend Micro has been installed. Patches are only available for OfficeScan. Also, machines with AMD Radeon HD 2000 or HD 4000 series video cards are facing problems. If you’re using either of these cards, the new Windows build is showing up an “INVALID_POINTER_READ_c0000005_atidxx64.dll” error code and locking the screen. Meanwhile, Microsoft says it is working on a resolution but warns admins not to expect a solution until “the 2019 timeframe”. 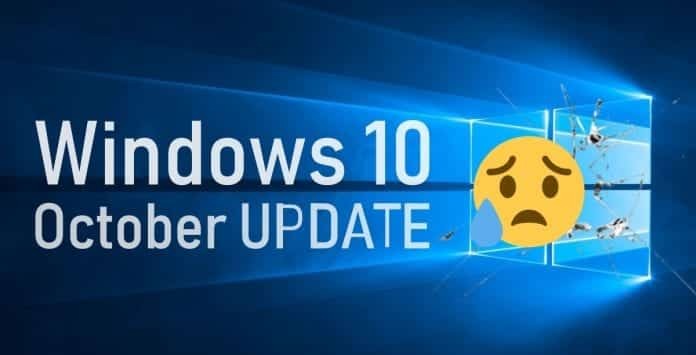 Considering the share of problems still surrounding the latest Windows 10 October 2018 Update, it will be advisable for users to wait a bit before installing a fresh new OS update.